We’ve really been looking forward to the start of our CSA from Bellair Farm. We’ve been getting a lot of greens so far and are awash in bok choy but that’s not such a bad problem to have. This week we got the first carrots of the season too and we thought the carrots and bok choy would make a nice stir-fry. 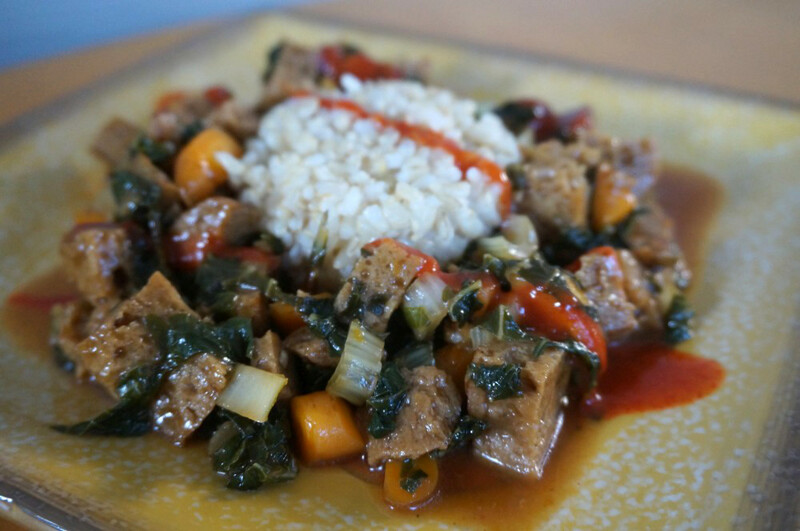 We also had some homemade seitan in our fridge that we needed to use up but you could really do this with any protein (and any veggies for that matter). Whisk all the sauce ingredients together in a small bowl and set aside. In a wok or other large pan, fry the seitan in 1 Tbs. canola oil over medium-high heat until it’s starting to brown. Add the soy sauce and cook for another 30 seconds or so, stirring continuously. Remove from pan and set aside. In the same pan heat the remaining 1 Tbs. canola oil and cook the bok choy and carrots until they’re just starting to soften. Add the garlic and cook for another minute then add the sauce and cook just until thickened. Turn off the heat and add the seitan back to the pan stirring to incorporate. Serve over rice with additional Sriracha if desired.